This sign is hanging in a small eatery in Siem Reap in Cambodia. My daughter, Alyssa Schwartz, snapped this photo while she was there on assignment (she’s a writer). 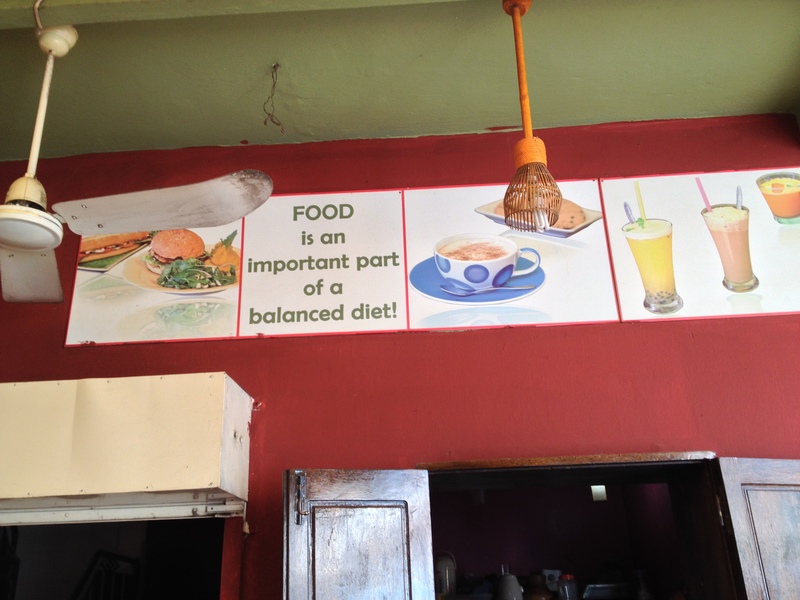 You might look at it and think: well, of course food is an important part of a balanced diet. But if you really consider it, it’s a concept that many people seem to have lost touch with. Yes, food is meant to sustain us – to maintain good health and prevent disease – but also to nourish us as individuals, family members and as part of a community. In the past, food has also meant tradition and has provided insight into cultural norms. But nowadays, it seems, for many, food is only about a quick fix – for example, a protein bar or a meal replacement to bridge the gap between breakfast and lunch, frozen convenience products for kids to snack on or for family meals. Many are too busy to sit down and break bread together. Cooking has fallen by the wayside. In some homes, there is no family member with the skills or the confidence to prepare meals. We live in a society filled with conflicting attitudes. The ability to prepare meals for a family is a skill that is given much too little respect, yet we have culinary stars and heroes on television cooking shows. But food is also about love. It’s about sharing and thinking about someone you care about. It’s not about how fabulous a meal you can make. It’s about showing someone you care about that you took some time – a few minutes or a few hours – to provide that person with a food you created. I always think of my daughters, when they were in pre-school, mixing up water and a little of every spice and herb in my pantry, to make their father soup. As they mixed it up, they discussed with each other about how “much Daddy is going to love it”. When they asked me if I wanted to taste, I answered that I wanted to save it all for Daddy. They had no idea just what their creations tasted like. And when my husband tasted it, he raved about how it tasted – before we discreetly tossed it. Today, both are incredible cooks who appreciate food. At the same time as we as a society have this dysfunctional relationship with food, supplement makers have preyed upon the fears of the public about how our food is grown. We’re being told that our soils are depleted of nutrients. Other pill pushers are offering up some miracle nutrient we didn’t know we needed. We need to get back to basics. We need to remember to that “food is an important part of a balanced diet” and that it’s key to our survival. 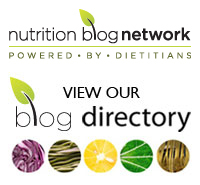 It’s Dietitians of Canada’s Nutrition Month. Let’s Simply Cook and Enjoy! Do you think that home economics should be brought back to the curriculum at school? Please share your thoughts about these issues in the comment section below. I definitely agree, old-school Home Ec needs to be brought back to curriculums everywhere. I see it everyday working at a university…..students grab snacks of chocolate bars and energy drinks to tide them over, and then the meal that’s eventually eaten is high fat, high carb garbage. Young adults do not have the nutrition basics, nor do they have simple food-prep knowledge. They are a generation who will raise their children on convenience foods and quick fixes. There needs to be a solution to the obesity issues Canada faces, and for the brain matter of future generations. I just love this comment. Food preparation has ,for a couple of generations, taken a backseat to almost everything else. I don’t think that families are taking the time to plan, purchase and serve wholesome food on a daily basis. Children are not being taught to cook because their parents weren’t taught. There’s time for everything else, processed food and fast food restaurants have replaced family cooking. Pity. I agree with you both, Vini and Vicky! Not only are families not taking the time to prepare nutritious eats but when they do, they are being discouraged from doing so. I have heard so many commercials which tell parents to stop spending their time cooking and buy their prepared foods instead. The ability to cook needs to be valued in the home – not just on TV! I think bringing Home ec classes back into schools would be great. With all of the negative messages kids are getting these days about how their bodies should look, they should be getting positive messages about how their bodies should FEEL and WORK. We need to give proper education about what it means to eat healthy. However…there would have to be a lot of research done (working not only with nutrition experts but also with eating disorder specialists) to make sure that the information is the best it can be. I have seen way too many kids develop body image issues after their schools brought in “healthy food” programs, because they just weren’t done properly. But yes, I think it’s a great idea. Thanks for sharing your thoughts, Marci! I agree that healthy food programs can be a minefield but I do believe that home ec is an essential part of education. On the other hand, I don’t think that sewing belongs in home ec (I, too, failed sewing or at least my projects never worked!). But teaching basic cooking skills is key to preparing kids for life. It doesn’t have to be about healthy eating – just food prep. You nailed it – slam dunk! Our priorities are broken. We invest so much energy and $’s in culinary showman-ship (fancy kitchens, celebrity chef’s), but neglect to honour cooking for family as such a nurturing act. How can we have food security, family income security if we don’t place value on this? Overscheduling our families with sports, dance, etc in the hopes of finding hidden talents has undermined family Wellness in the long run. Home Ec in school as mandatory – for sure – but it also needs to become a personal/family responsibility and a valued choice. Mindful eating and food literacy are key goals for raising healthy families. Joyce, I would say that you’ve nailed it too with your comments! Unfortunately society has shown parents that these important food issues and skills are not valued but it’s time for a change. We need to get back to food basics – food literacy and cooking skills for the next generation to be healthy!